We had the same considerations listed on comments: he was placed on respiratory isolation, sputum was non-diagnostic so a bronchoscopy was performed. There were no endobronchial lesions. TBBx and BAL were performed in the LUL. Biopsies revealed chronic inflammation. BAL smears were negative but since then he is growing Mycobacterium kansasii from BAL and 1 of the sputum samples. He lives in a different county from our previous infiltrate / kansasii case. 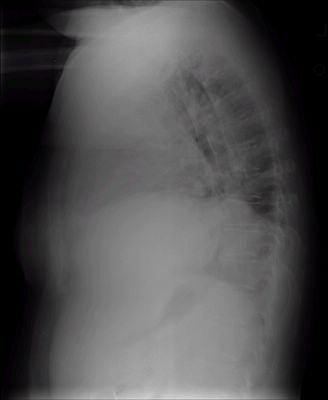 38 year old African American female with no medical problems presented to the ER with abdominal pain. This ultimately was determined to be functional (IBS vs. gastroenteritis) and has since resolved. In her workup, a CT scan was performed. With the cuts through the lungs, there was noted enlarged hilar adenopathy. The abdomen was normal. 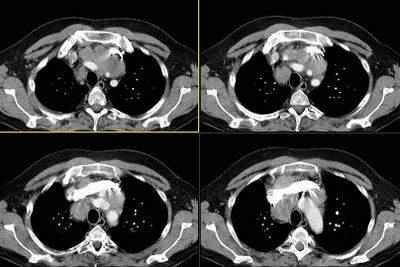 Her PCP completed the workup by getting a CT of the chest. This revealed enlarged hilar adenopathy and she was referred to me. She has very minimal pulmonary symptoms with the exception of dyspnea with severe amounts of exertion (i.e. running up 2 flights of stairs with groceries). She can walk really an unlimited distance on level ground. She has no cough, fevers, chills, skin rashes, ocular symptoms (an eye exam is pending), chest pain, nausea, vomitting. Bilateral hilar and mediastinal adenopathy as described above with similar areas of adenopathy in the upper abdomen. This is likely on the basis of lymphoproliferative disorder although noncavitating granulomatous disease is a possibility. 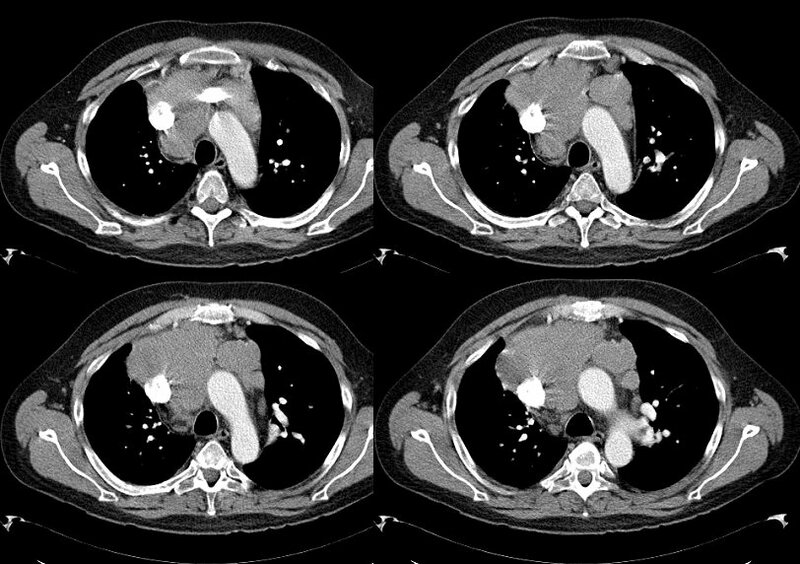 CT abdomen and pelvis to identify the extent of the adenopathy is recommended. Patchy areas of consolidation in both lungs particularly in the lower lobes noted. There is one nodular opacity in the right upper lobe that could also be inflammatory but it should be followed to rule out neoplastic lesion. 2. Moderate to severe areas of scarring noted in the lower lobes and to a lesser extent in the upper lobes. .
3. No areas of alveolitis or active air-space disease. No pericardial or pleural effusion seen. 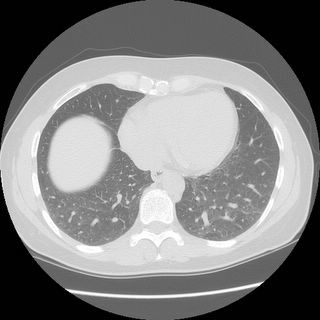 For the purists:CXR: enlarged hilar adenopathy. No evidence of interstitial markings whatsoever. She does not have a pathologic diagnosis at this time. How would you proceed? After everyone renders their opinion, I will tell you how I proceeded. After reading the comments here, you can see the followup to this case Here. This will be another brief case of an abnormal radiograph. 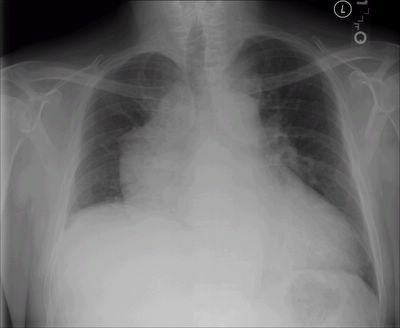 60 y/o male with long smoking history, transferred from OSH for evaluation of an abnormal CxR. He had been admitted to the OSH and failed to respond to IV ABTx (also with a "respiratory" FQ). He is a limited historian but admits to a persistent cough, purulent sputum production and occasional hemoptysis for "a few weeks". He has lost over 20 lbs in the same period. PMHx: No label of COPD. SHx: Quit TOB "a few weeks ago". Used to smoke 2 ppd. ROS was only remarkable for what was noted above. On exam, well-nourished, well-developed, overweight male. He has rare occasional ronchi but otherwise clear lungs. Remainder of exam is unremarkable. 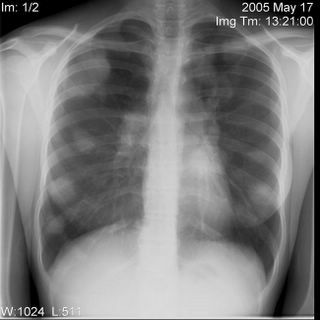 Chest radiograph and CT are shown below. What would you do next? This is the woman with low DLCO. The stress echo came back as no evidence for ischemia, (although the HR was only 130, which is 76% of the predicted max - she stopped because of pain in her hips. You will recall she had b/l hip replacements). Anyway, the only thing left is an EMG (reminder that her MIP's, MEP's and MVV were all normal). Any other ideas? Her low DLCO and dyspnea are real, despite the negative workup thus far. We are going to ATS in San Diego. A new case will be presented on Thursday, most likely. In the meantime, feel free to send your own cases (or simple questions/diagnostic dilemmas) to pulmonaryroundtable@gmail.com and it will be posted upon return. Your email address will not be used in the postings. If you have pictures (CXR's, histo, etc), simply attach them to your email. He had come in on a Friday and was placed on resp isolation for the reasons you outlined. He was scheduled for a bronch on Monday but over the weekend his sputum smears were + for large AFB.His PPD was negative. We started him on 4-drug TB Tx and sent him home. On F/up he was much better with clearing infiltrates. His Cx though grew M. kansasii and no MTb. 22 Y/O F with 6 month H/O LLQ abdominal pain and low back pain. Over last 2-3 months. Also c/o progressive dyspnea, subjective fevers, sweats, 22 lb wt loss over last 6 months. W/U @ OSH (over the last 4 months) revealed left adnexal mass and pulmonary nodules. Pt underwent FNA of pulmonary lesion which was reportedly "inconclusive." Pt was told by PCP that no further w/u was indicated at this point. She was seen by gynecology this week who did a transvaginal ultrasound revealing 1 cm periadnexal mass, that did not look particularly suspicious for malignancy according to their notes. She did not bring any outside records or films. What do you think she has and how would you proceed? 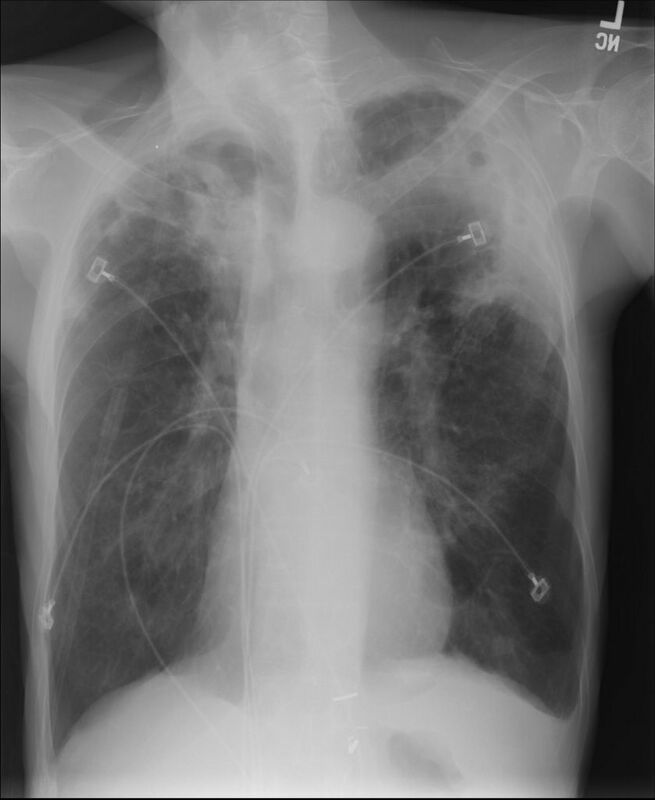 This is a 68 year-old man with a long history of chronic obstructive pulmonary disease who presented to an OSH with bilateral pneumonia. 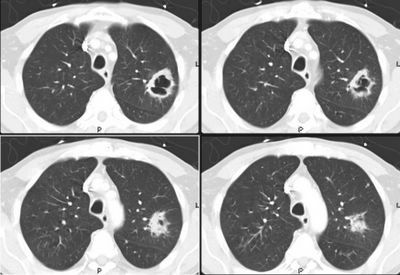 He was treated with antibiotics ("respiratory" fluorquinolone) but did not have a significant improvement. He was transferred for further eval. He presented with sub-acute (a few days) onset of low-grade fevers and cough productive of scant purulent sputum. No weight loss, no hemoptysis. PAST MEDICAL HISTORY: Chronic obstructive pulmonary disease, chronic headaches, no cardiac disease. SOCIAL HISTORY: Significant for previous smoking history. Quit 2 years ago. No alcohol abuse, no illicit drug use. No significant occupational exposures. Exam: AAOx3, in NAD. Most of exam was unremarkable except for respiratory: chest ymmetrical with good expansion bilaterally, increased AP diameter. Hyperessonant to percussion throughout. He has a very prolonged expiratory phase throughout with decreased aeration bilaterally and bilateral upper lobe rhonchi. What would the DDx and what would you do next? - 74 year old woman with recalcitrant cough and bronchiectasis. IgE: 353 (0-150), Aspergillus IgE undetectable(RAST), Aspergillus skin test neg. 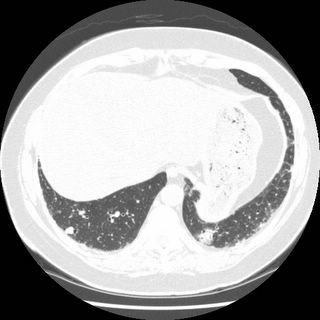 There is mild to moderate predominantly central bronchiectasis involving all lobes. Mucous plugging is noted in the lateral segment of the middle lobe, inferior segment of the lingula and in the left lower lobe. Patchy peripheral atelectasis/scarring is noted in the lateral segment middle lobe and the superior segment of the right lower lobe. Lung biopsies: Eosinophil-rich bronchitis with abundant mucus containing eosinophils, possibly allergic bronchopulmonary aspergillosis related. Cytologic examination: Negative for neoplasm. Abundant eosinophils admixed with alveolar macrophages.No pathogens present with routine stains. Based upon the results - patient was treated with 40mg prednisone followed by a slow taper. She responded well with decreased cough, improved sleep. Decreased cough. No wheezing on exam. ENT evaluation at OSH - nl CT sinuses and nl ENT evaluation. Attempts to completely wean off prednisone resulted in exacerbation of her symptoms (increase ESR and slight increase in peripheral Eos as well) requiring burst of prednisone with subsequent stabilization. Most recent attempt to wean off b/c of concern of steroid myopathy resulted in increased respiratory symptoms (IgE 161). Repeat Cx - oral flora. See Original post for review of labs previously performed (Quant IgG nl). No significant exposures. This is a patient from Friday clinic that I've been following for the last year. I'll present the patient's first presenation to our clinic in order to get your initial diff Dx. I'll give you the ensuing follow-up and tests after I've heard from you. 74-year-old never smoking woman referred from OSH for 6 month history of productive cough. Her other history is significant for chronic sinusitis,hypertension, and lower extremity edema. Six months ago she noted increasing cough that was productive of gray to yellow sputum. Since that time, she has had several short hospitalizations receiving steroids and antibiotics with short lived improvement. Medication regimen includes albuterol, atrovent Neb and Advair with minimal subjective response. No previous history of asthma. 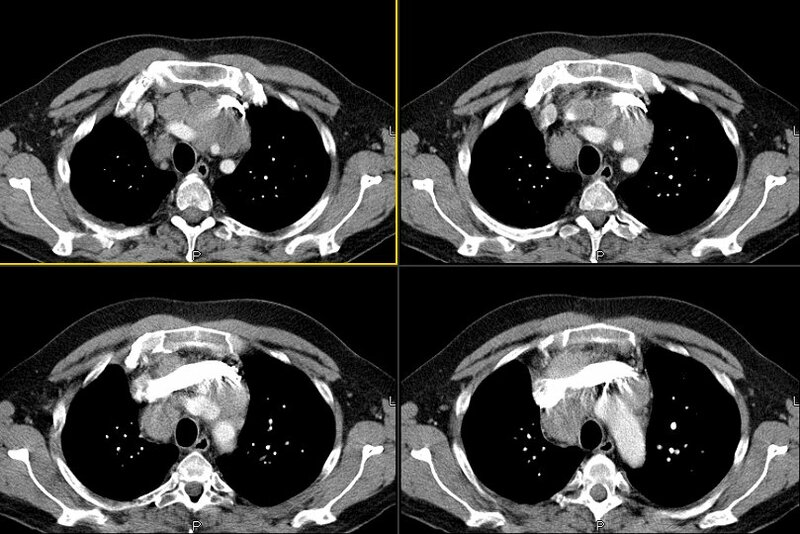 PE protocol CT performed at OSH 6 months ago revealed central bronchiectasis and patchy peripheral GGO without filling defects. LE dopplers neg. Echo nl. BAL was peformed 3 months ago at OSH and was negative for pathogens(AFB, fungal) ; cytology neg. Pertinent labs from that time: cANCA, ANA (-); positive pANCA; normal levels of gamma globulins, and RF of 55(nl <25). She presents to our office for further evaluation. Her cough is still present and continuous. She sleeps poorly and is fed up. We observed frequent coughing fits productive of yellow-green sputum. She has had weight loss of almonst 20# in last 6 months. No fevers, chills, hemoptysis. No sick contacts, pets, or recent travel. Norvasc, Aldactone, Actonel, Nexium, aspirin. Retired. Worked as surgical technician. Never smoker. Previously PPD neg. FEV1 of 1.57 (71%), FVC 3 L (96%), FEV1/FVCof 52%/71% (74%). Fev1 3 months ago was 2.38 L. Recent OSH labs: CBC and diff. wnl, ESR nl. What's your differential? Other tests? 58-year-old lady known to have multiple medical problems including rheumatoid arthritis diagnosed about 14 years ago. She was evaluated for a possibility of recurrence of kidney stones and kidney problems and had CT of the abdomen. 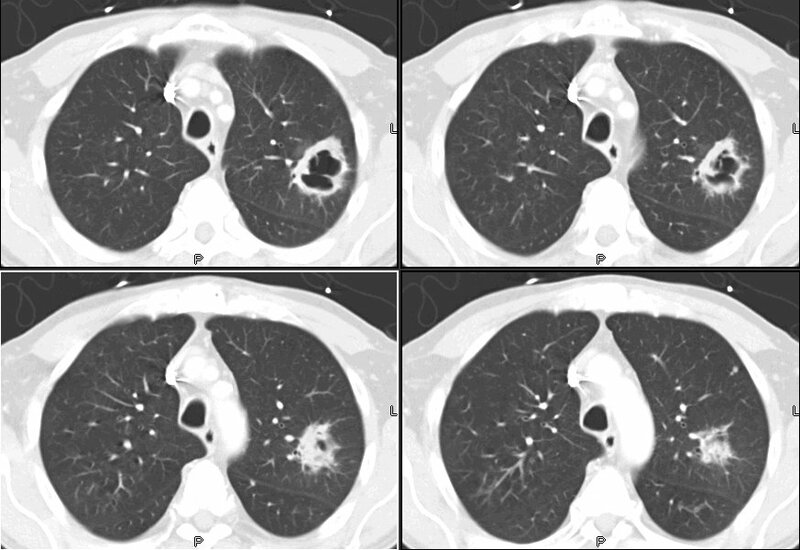 On the lung cuts of that CT scan, there was a lung nodule and that was further investigated by a dedicated CT of the thorax. The patient was referred to us for further evaluation and management of the small nodule. The patient denies having any cough on a regular basis. No history of hemoptysis. She has shortness of breath upon heavy exertion and can climb two flights without problems. No fever or chills. MEDICATIONS: The patient is currently on Enbrel injection twice a week. She is also on Levoxyl 0.125 mg p.o. once per day, Protonix 40 mg p.o. once per day, and multivitamins. She received methotrexate in the past for 1 year, and stopped it secondary to LFT disturbance. Last methotrexate dose 6 years ago. company as a dispatcher and also a supervisor. She also currently is doing flower arrangements and sewing crochet. There is subpleural reticular change, mostly in the lung bases, with lesser amounts in the upper lobes. There is some ground-glass and each upper lobe also an suggestion of minimal honeycombing in the left upper lobe. The changes in the lower lobes have progressed since the prior study done 3 months earlier Representative slices, from apex to base are shown below. Transbronchial biopsies were not done (patient coughing). Summary: 58 y.o lady with severe rheumatoid arthritis on Remicade, with restrictive ventilatory defect and normal diffusion, with mild honeycombing/ early fibrotic changes that seem to be progressing over 3 months, with eosinophilia and lymphocytosis on the BAL. what is the next step? While I am preparing my next post, are any of you (or your institutions) going to be involved in the nicotine vaccine trials? Tennesse has very high smoking rates, far above the national averages and some of our patients have heard about in the media. People at HF give decadron for COPD and asthma exacerbations. I am used to solumedrol. Most people use solumedrol - is there an advantage of one over the other for the treatment of copd/ashtma? This is a 43 y/o man with previous Hx of mild HTN. He had been told before he had a "big heart" but had no further specific w/up. He came to see us with a dry cough, dyspnea on exertion (progressive) and orthopnea. No PND, no lower ext. edema. His HTN has been worse and he is requiring 4 anti-HTN meds. He has been found to be "borderline diabetic" and a CxR showed again a "big heart" with large RV. His exam revealed central exp. wheezing and elevated BP. His spiro revealed moderate obstruction. Here is his PA with the "big heart"
BTW, he doesn't smoke. Any suggestions? (JJ, you know the case so don't give it away). 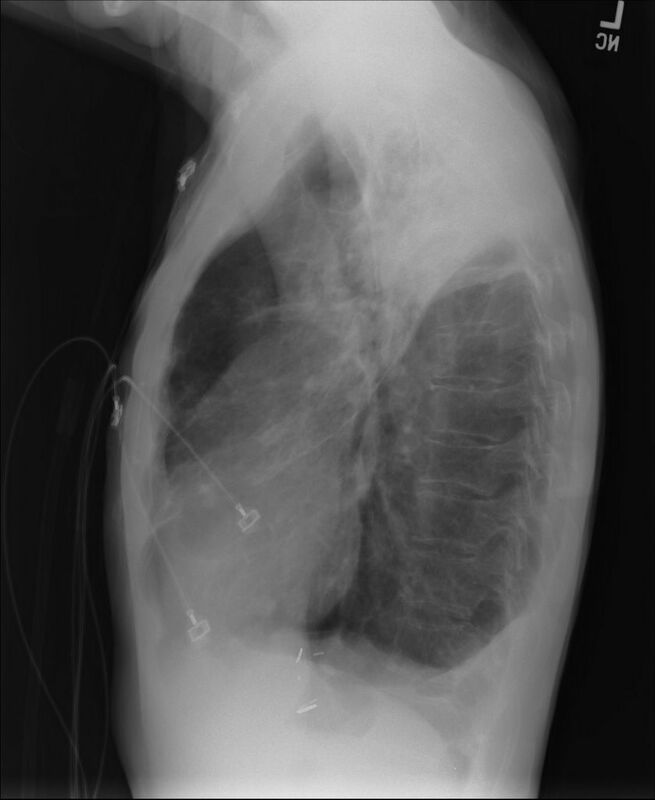 Subacute dyspnea in a previously healthy 41 year old. 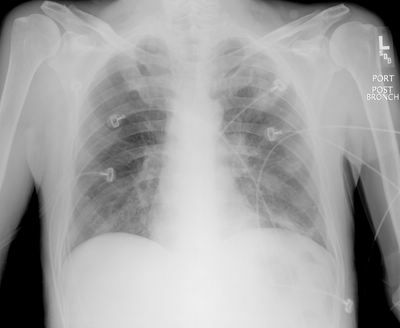 This is a previously healthy 41-year-old woman with no significant past medicalhistory who presented with three weeks of dyspnea and chest tightness. Prior to this, she had been doing 1 hour of aerobic activity without a problem on a regular basis. Now, she has to rest after 1 flight of stairs. During the week prior to the onset of symptoms, shesays that she spent a significant amount of time indoors painting and workingwith other chemicals such as paint thinner as part of extensive home remodeling. Following this work she noted the onset of chest tightness, which progressed over one week when she presented to an outside hospital emergency room. Evaluation there that ruled out a myocardial infarction. She also says that a V/Q scan was "normal." She was discharged with oral Protonix. Subsequent work-up included (reportedly) a normal dobutamine-stress echo. She was unable to do an exercise stress b/c "my heart rate increased too rapidly." Over the 2-1/2 weeks prior to initial presentation she developed a persistent dry cough. Although the cough and dyspnea are persisting, her chest tightness has been generally improving. She denies any hemoptysis.She has denied any fevers, chills, or sweats. Although she notes chesttightness, she denies any pleuritic component. She denies any palpitations. She denies any lightheadedness, dizziness, or blurry vision. She has had no recent changes in her weight. She denies any hematuria. She denies anyarthralgias/arthritis, or skin rashes. PMH/PSH/Soc History are otherwise unremarkable. Her maternal GM died of IPF at age 66, no other family members with ILD. Her physical exam was entirely normal, except for minimal bibasilar rales at end inspiration and trace edema in her lower extremities. These were present on her follow-up, but I did not notice them on her initial presentation. Initial spirometry: FEV1 of 2.26 liters which is 69% predicted. The FVC is 2.78 which is 66% predicted. The FEV1 to FVC ratio is 81%. Pulse oximetry is 98% on room air at rest. Full PFT's 1 week later: FEV1 2.05 (63%, -> 2.55 post albuterol), FVC 2.4 (57% -> 2.88 post albuterol). TLC 75%, RV 100%, DLCO 68%. Normal CXR. 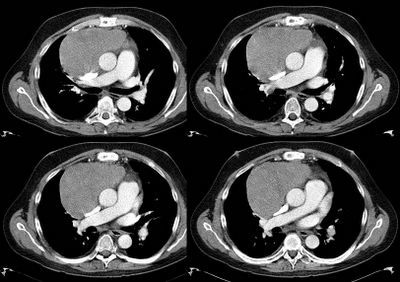 HRCT showed some dependent ground glass opacity that resolved on prone images and, interestingly, a "moderate" pericardial effusion with distention of the IVC. So far, ANA, RF, anti-dsDNA are negative. CBC was normal except for an MCV of 78. Normal TSH. Normal chemistries. An echo here is pending. I'll start it off with a patient referred to me for dyspnea with an isolated DLCO. Leave any comments about what you might do next or other suggestions/questions. Not all of the ones you all present have to be this long. 50-year-old woman with a history of arthritis (rheumatoid factor negative in 2001) who had bilateral hip replacement (right hip in December and left hip in February 2005). Last month, one month postop, the patient noticed that she was out of breath while walking from the parking space to the local store. No CP. Since that time, she has had dyspnea on exertion with just minimal exertion such as walking from room to room. She denies any dyspnea at rest or other triggers, although on that first episode described above the air was more cold. The patient denies any acute chest pain, cough, fevers, chills, night sweats, or other constitutional symptoms. The shortness of breath is relieved with rest. She went to a local Emergency Room for this dyspnea and the workup revealed a normal BNP, negative lower extremity Dopplers, an EKG with normal sinus rhythm and a VQ scan that was read as "normal appearing." A confirmatory PE-protocol CT was not done, perhaps because she had a history of getting nauseous from the dye. Other workup included a spirometry with evidence of abnormal DLCO. Of note also, the patient did have some postop anemia, but this has been treated with iron. PAST MEDICAL HISTORY: Arthritis, depression. MEDICATIONS: Effexor, Xanax, and iron. SOCIAL : ex-smoker. She did smoke half a pack a day, quit in 1999. The smoking was intermittent. Occupation is a lawyer. No known occupational exposures. Exam: VSS Weight 145 lb Lungs: CTA. Cor: normal. Ext no edema. ABG 7.47/28/113 on RA. carboxyhemoglobin not high. Lactate was 7.1 but this must be an error. PFTs: everything is normal (including RV, TLC, IVC). DLCO is 61% predicted. corrected to VA (if you beleive in that) makes it still low at 68% predicted. 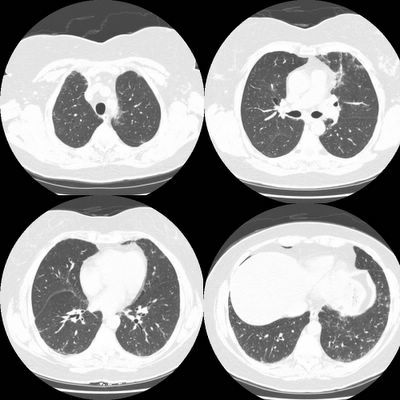 HRCT: No evidence of ILD. radiologist called masaic pattern on expiratory LLL but the call is soft. PE-protocal CT was negative for embolus. Echo showed PAP of 25 with normal vnetrical and atrium size. Exercise test was order and not done yet. 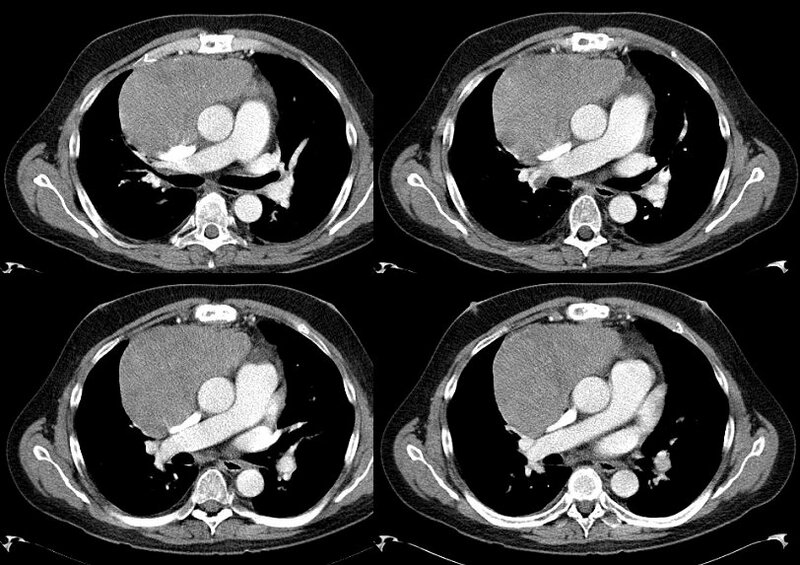 Here is the HRCT with the possible mosaic.